Armstrong is regarded as one of the 20th century’s great entertainers. Richard Swainson says his tour, promoted by Harry M Miller, was an important milestone in the cultural life of Hamilton and New Zealand. In Wellington, the “world famous jazz trumpeter” was welcomed by US Ambassador Anthony B. Akers with an “afternoon party”. 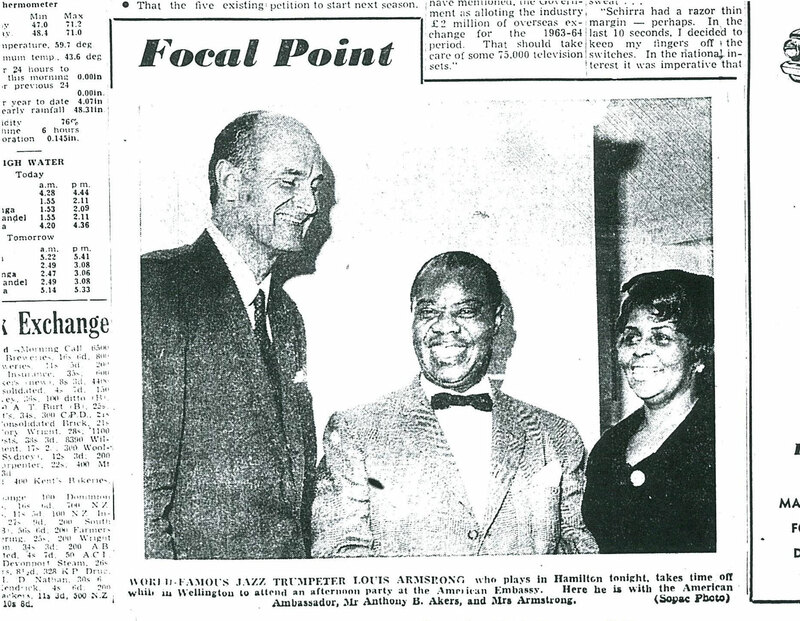 A plaque commemorating the Louis Armstrong shows was installed in ‘The Founders’ beneath the bronze piece recording the theatre’s debt-free opening by Mayor Dr Denis Rogers in 1963. The 2013 plaque features veteran photographer Bill Lindberg’s shot of ‘Satchmo’ chatting to fans thronged outside (above top). The theatre balcony was buried a decade ago within the theatre’s entrance redevelopment. 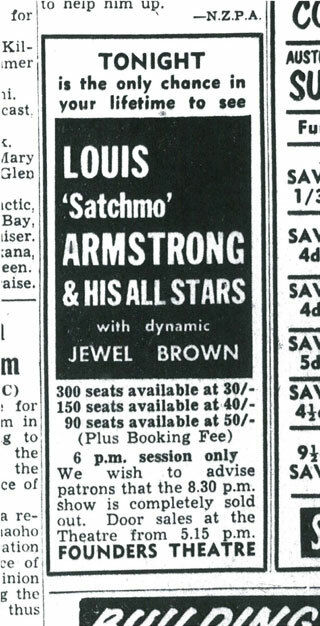 Adverts in the Waikato Times at the time confirm Louis Armstrong’s popularity back in 1963. The newspaper’s critic ‘A.E.K’ writes the expected tribute of the concerts and refers to many of the Armstrong numbers that carry the jazz legend through the years: as well as ‘The Saints’, there’s “Blueberry Hill”, ”A Kiss to Build a Dream On”, ”All of Me”, ”Jeepers Creepers”…. Swainson points out ‘What a Wonderful World’ wasn’t recorded until 1968. 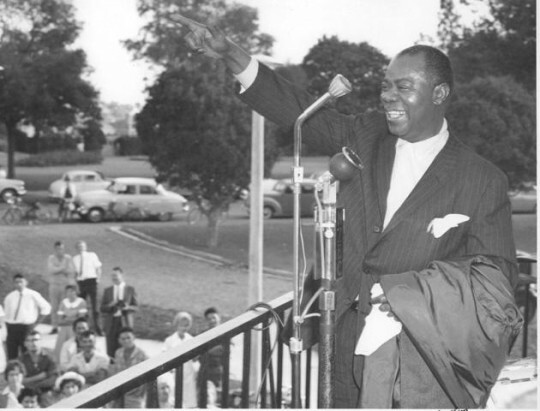 Five years later, Louis Armstrong recorded that other favourite ‘What a Wonderful World’.